For an author whose work has always been concerned, above all else, with the idea that “the world is so unpredictable,” it seems no small irony that Paul Auster’s fiction has remained so rigidly formulaic over the entirety of his career. For years, anyone even remotely familiar with the author’s MO has been able to accurately anticipate not just how his latest books will end, but also the themes explored, the types of characters encountered, and the very grammar and cadences of the prose. 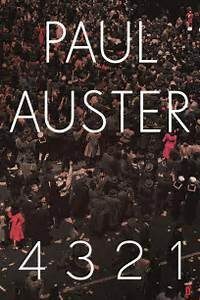 While Auster’s latest novel, 4321, may just be able to surprise some of these readers with the sheer size of the book (at 866, pages it by far the longest novel Auster has ever published), there is unfortunately little else in it that the author hasn’t already done many times over. A bildungsroman, 4321 tells the story of Archibald Isaac Ferguson (Archie), a New Jersey-born baby-boomer. The novel is split into four different sections, each section telling a different version of Archie’s life. These parallel narratives are used primarily to explore the ways in which chance and coincidence inevitably shape the lives of human beings. In typical Austerian fashion, chance often manifests itself in the form of catastrophic, usually fatal, accidents which start to occur with almost comic frequency. There are car crashes and fires (two apiece), a heart attack, a brain aneurism, even the most improbable of all misfortunes – a deadly lightning strike. Significant moments in history are also repeatedly referenced in order to bolster the idea that people are always shaped by their context, their lives continually and unavoidably altered by circumstances beyond their control. Indeed, almost every major American headline of the 1960s appears in the novel at some stage, each with varying degrees of success. The Kennedy assassination, for example, is handled with care and is used effectively to both reveal important elements of Archie’s character and to create a harrowing portrait of a nation first in shock and then in mourning. Yet, in contrast, there is a painfully longwinded episode later in the novel recounting the 1968 Columbia University protests which reads more like an excerpt from a high school history text book than a piece of narrative fiction. Often major historical events are merely skimmed over with a single sentence, giving the impression of a strange kind of news-ticker running throughout the book – something always there in the periphery but which rarely connects to the larger story and therefore hardly feels worth paying attention to. As each of the narratives progress and chance doles out unequal measures of both fortune and disaster to the four Archies, the trajectories of their lives become increasingly divergent. Yet even when their circumstances differ greatly, their personalities remain almost entirely parallel throughout the novel. All have a great passion for literature and have ambitions to be writers, they all love sports, their politics remain almost identical, particularly regarding their opposition to the Vietnam War and their support of the Civil Rights Movement. Even as Auster seems to insist on the primacy of coincidence in shaping the lives of human beings, these similarities between the Archies make it increasingly difficult not to see an apparent determinism at play in the text. Perhaps this was intentional and Auster wanted to convey the idea that both nature and nurture shape who we are, but it ultimately feels like a missed opportunity. At close to 900 pages, Auster could have explored more avenues; the paths and personalities of the four Archies could have diverged a little further. As it stands, the vast similarities between them eclipse the differences in their circumstances and the whole book eventually ends up feeling like the same story told four times over.